If you are a teacher, you know that your job involves so much more than just standing in front of the classroom and instructing your students. There is a long list of tasks that consume your day, and what you need more than anything is a way to keep it all straight. If you need a Teacher Checklist that will get your extensive to-do list together, you will find that one is readily available on this page. The template is free to download and comes at no risk. The template can be customized to the unique requirements of your school. The template is easy to use and simple to learn. Your Teacher Checklist is something that you could use for a particularly hectic week or could be a useful tool that you would use year round. Download the template from the website and save it as an Excel file. Remember to save it where your other templates are within MS Office. Open MS Office and select Excel, selecting the option to use a template. Choose the checklist template from the options. Use the Excel sheet to list every task that you have to do in the immediate future. This can be everything from taking out the garbage that morning to parent/teacher conferences in two months. 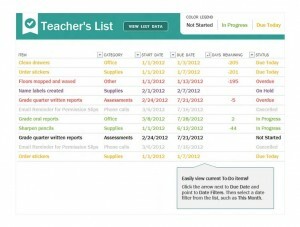 You will be able to sort your tasks by category, due date,start date, and status. Once your list of tasks are filled out you can check them off by changing their status as you complete them. You can prioritize the tasks either by how long you have to accomplish them, by their difficulty, or by their importance. If you follow these simple steps, you will find that your Teacher Checklist does most of the hard work of organizing your day for you, leading to better time management and less stress for you to pass along to your students.